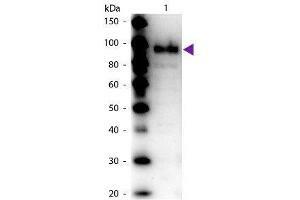 Western Blot: Phospho Enol Pyruvate Carboxylase Antibody [NBP2-44235] - lane 1: Phospho Enol Pyruvate (PEP) Carboxylase. Lane 2: None. Load: 50 ng per lane. Immunogène Anti-Phospho Enol Pyruvate Carboxylase Antibody was produced by repeated immunizations with maize leaves Phospho-enol-pyruvate Carboxylase. Indications d'application Western Blot 1:1000 - 1:4000, ELISA 1:10000 - 1:40000, ImmunohistochemistryAnti-Phospho Enol Pyruvate Carboxylase antibody is suitable for western blotting, IHC and for ELISA. Researchers should determine optimal titers for applications that are not stated below. Reconstitution Reconstitute with 0.1 mL deionized water to desired concentration.